Tokyotype , Tokyo? , Japan? Here is an interesting Japanese typewriter that we know absolutely nothing about. 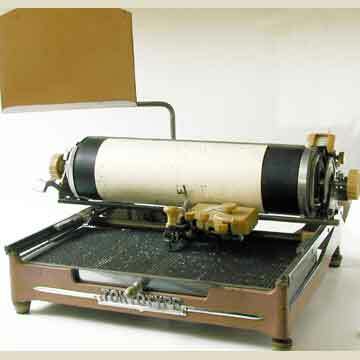 What we know is that the machine is based on the principle of the very first Japanese typewriter, the 1915 Nippon, but that is all. The Tokyotype has a design reminiscent of the 1950s, although it may in fact have been produced much later, since the design for products for the Japanese domestic market never kept pace with international fashion. Apart from the name Tokyotype, the machine has no further marks to identify it. We do not even know if it was actually made in Japan. There is no serial number. The machine has a square tray of type. The right character is selected with the index pointer. When you push the lever down, the type is lifted up from the tray and printed against the platen.